Air compressors are an essential part of numerous industries, from chemical manufacturing to mining. However, like any large piece of equipment, air compressors must be used correctly and conscientiously to ensure the safety of your employees. In this blog, we list five steps that can make your team better prepared to use an industrial air compressor. If you were an individual with a personal air compressor, you would familiarize yourself with the owner’s manual before even switching the machine on. As a business professional whose industry relies on compressed air, it’s important to train your employees thoroughly before they ever touch a compressor. Ensure that employees know how to use the compressor and how to recognize problems with the equipment. All of your employees who are authorized to use the air compressor must know the appropriate pressure levels, the line draining procedure, and the correct way to use the emergency shutoff valve. Additionally, you should spend training time focusing on correct safety protocol. For example, the air compressor hose should never be pointed at a person, especially when the hose is attached to a pneumatic tool. Highly pressurized air can cause skin or eye damage when directed right at someone. You should also require that employees wear correct safety gear as we’ll discuss in section four. Air compressors may be powerful, but they’re also vulnerable to changes in moisture, temperature, and position. Before your employees use the compressor, they must perform a complete safety check. This check may include draining the lines, lubricating the motor, and taking other preparatory measures to ready the air compressor for the day’s work. If your employees notice any hose deterioration, loose valves, or other visible problems, you should have a repairman diagnose the issue before using the compressor again. Employees should also postpone starting a project if the ground is wet, icy, or uneven to the point that they cannot take a firm stance when using the air compressor hose. An air compressor should never be used in a cluttered space where the pressurized air could create flying debris and contribute to unsafe working conditions. Because of the high levels of air pressure and moisture found within industrial air compressors, these machines can deteriorate rapidly if an issue arises. In addition to routine safety inspections each time the compressor is used, you should also prioritize regular professional inspections. Have your compressor assessed at least once a year by a trained service technician. Perform recommended daily inspections. Change the air filters, oil & oil filters as recommended by the manufacturer. Always use the recommend oil. You should also schedule an inspection immediately if you notice any change in compressor performance or sound. This step ensures that necessary air compressor repairs can be handled quickly and your team can return to work. • Face masks, particularly if using pneumatic tools to paint or apply chemical solutions that could be toxic if inhaled. • Protective eyewear, especially when using compressed air for sand blasting and similar tasks that create airborne debris. • Sturdy gloves to reduce the risk of hand injuries if a hose becomes loose and begins whipping. You may also want to require that your employees wear pants, long sleeves, close-toed shoes, hard hats, and aprons to further minimize the risk of injury. If your air compressor is located outside, check that your employees are dressed appropriately for the weather as well as the work. For example, air compressor operators should bundle up in the winter because the extra moisture created during compression can create dangerously low temperatures. When you’re in the middle of a task, it can be tempting to just pause what you’re doing to have a conversation, take a drink, or run to the restroom. However, it’s important to train your employees to turn the air compressor off when they are not actually using the machine. 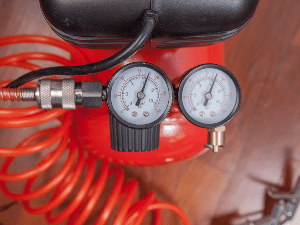 Attempting to crimp or coil the air compressor hose to “pause” the air flow can lead to dangerous pressure levels within the hose and the compressor itself. In these situations, an employee could potentially drop the hose or the pressure could build too high and cause bursting. In either case, the compressed air can no longer be easily controlled and could cause injury. Use these guidelines to ensure that your compressor can be used efficiently and safely, regardless of its role in your business model.